Glemsford is in Suffolk. It sits on a small hill above the River Stour and the River Glem, from which it takes its name. Thus it also looks down on, and out and over, Essex. Although the village is signposted on the A1092 between Cavendish and Long Melford, almost the entire village lies away from the main road, which is a blessing for the village. 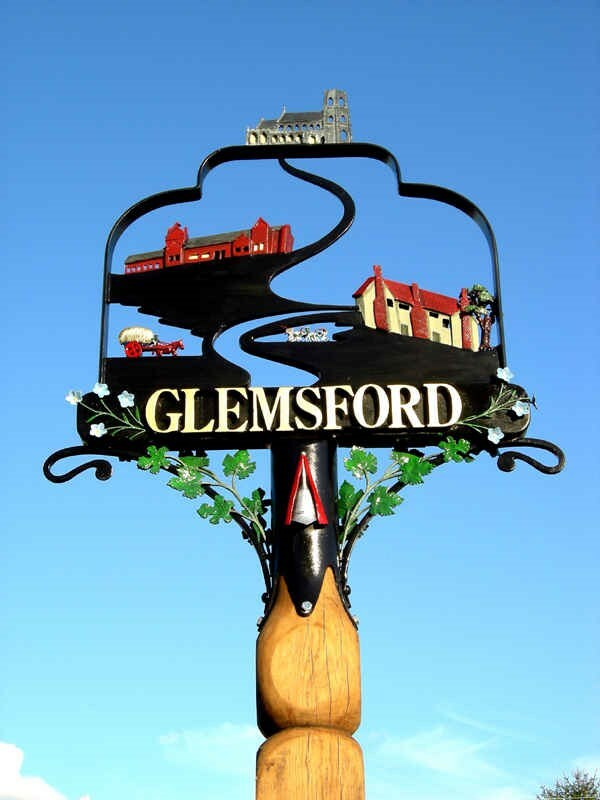 Glemsford is an ancient village, dating back to Domesday, and before. Although it may have acquired its nickname only last century, it is possible to trace the history of the village across many more centuries through the huge variety of buildings and fieldnames. Park Farm for instance is thus called because its land was once the deer park for the Abbot of Ely, in whose gift the village was. Park Farm itself stands close to the village church which is dedicated to st mary the virgin.The church is a fine structure and, although not on the scale of Long Melford or Lavenham, is a good example of one of those churches which benefited from the successful East Anglian wool trade of the late middle ages. Elsewhere in the village are to be found many examples of English domestic architecture across the ages. There are several fine hall houses as well as a wide range of more modest weavers cottages which bear witness to several stages of the village's development over the centuries. On Bells Lane there is the structure of the horsehair weaving factory which prospered in the 19th Century. On Chequers Lane, a silk weaving operation still continues, having first arrived in Glemsford in the 1820's, from Spitalfields.